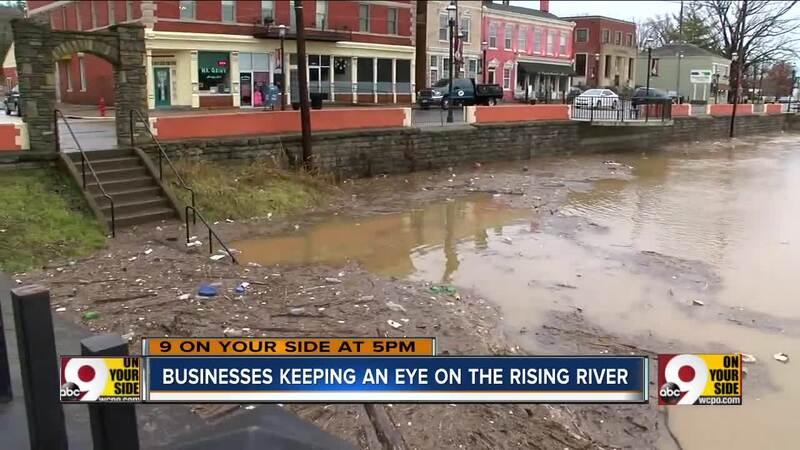 A look at the rising Ohio River from New Richmond&#39;s Front Street Cafe. 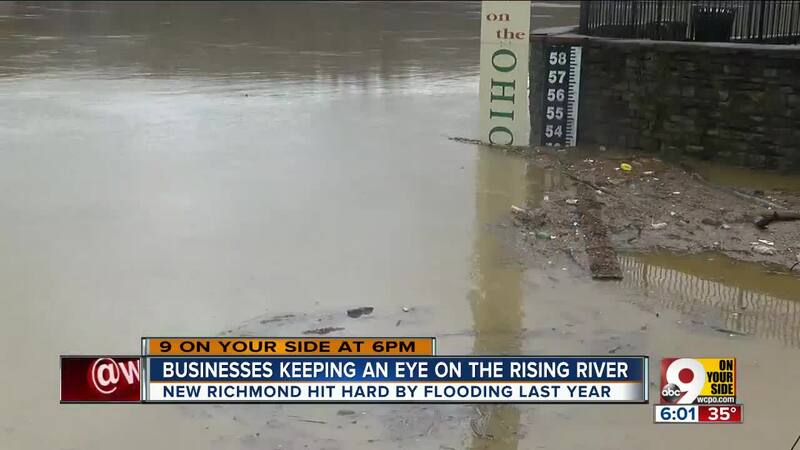 NEW RICHMOND, Ohio — With the Ohio River expected to crest at 56.3 feet, New Richmond business owners have been keeping a close eye on the rising water. "Every business door in New Richmond, you'll see a little number," Front Street Cafe owner Robert Lees said. "Everybody knows their number." For Lees' cafe, it's 60.79 feet. They hope the river never reaches that level. "You kind of know when to move out if you have to, or when to move up if that would suffice," Lees said. A year ago this month, the Ohio River crested at 60.7 feet. Lees said the water missed his cafe by just 7 inches. "We were blessed," he said. A third of the village was under water. "Last year was pretty brutal," New Richmond Village Administrator Greg Roberts said. "We had significant amounts of water on the streets. We're hoping to avoid that." New Richmond resident Richard Wuerdeman said he knows "for a fact" water will reach his basement, and his family is preparing in case the water rising higher than that. "We make sure to have 'go bags,' he said. "Phones charged and ready to go and all the important documents ready to go, along with our dogs." Wuerdeman said they're thankful that normally only their basement floods. "It was worrisome, but if we lose the house — it's a house," he said. "We keep family together, that's what matters most." About a dozen New Richmond residents were displaced by the flooding last year. Roberts said it's not expected to get that bad this year, but they're preparing in case it does. "You never get fully prepared for these events," he said. "Being along the river for an entire existence, the village and residents have experienced this before. So there's collective memory in terms of how to behave, what to do."